Technically and in medical terms, scoliosis is a deformity of the spine. But that doesn’t mean I’m deformed. I am not defined by my spine. I am defined by all the things I love to do and by the people I love to be with. I just happen to have scoliosis. Just like I happen to have freckles. Freckles make me more prone to skin cancer, and so I’m aware of that, I use preventive measures and I move forward with my life. Let’s do the same with scoliosis. What is scoliosis? Scoliosis is not a death sentence for everything fun. Scoliosis is not a death-sentence to everything you enjoy about life. The diagnosis of scoliosis is simply information. Add it to the pile of information you already know about yourself. What is scoliosis? Scoliosis is not decision-free. So if the diagnosis of scoliosis is simply information, then what are we supposed to do with that information? Well, it’s like anything else in life–make a decision– you can’t make a decision (surgery, or no surgery, brace, or no brace, exercise, or no exercise) until you have all the information. Therefore, I dub you Scoliosis-Detective. Your team of doctors, therapists, orthotists, Scolio-Pilates practitioners, we are simply your junior detectives. We can only offer you advice from our point of view. Each of us in our respective fields has done enough work and enough study that we can offer you a respectable opinion. And then you get to choose what happens with your life. What is scoliosis? Scoliosis is not about sitting still the rest of your life. The only opinion I can offer you is on the choice of exercise or no exercise and I suspect you know where I stand (or jump) on this topic. Have you heard that “sitting is the new smoking”? Yes, sitting is being compared to just as many health hazards as smoking. We are human. We must move. Then the question becomes, what movement? 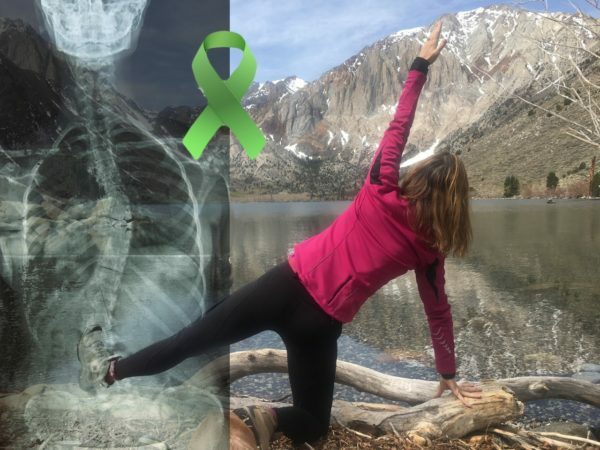 Here’s my take on it: I divide exercise into exercise that will assist me with my scoliosis and exercise that will be great for my body, but won’t necessarily help me with my scoliosis. And then I do both. Everyday, I do Scolio-Pilates corrective exercise for my spine. I fit these exercises into my everyday life–walking the dog, typing this letter to you, driving… And everyday, I do exercise that is just like what other non-scolio’s do: walking the beach, playing frisbee, running with the dog, high intensive training, etc. etc. The Scolio-Pilates keeps me pain-free and able to do the “real life stuff”. Do I modify at times? You betcha. My neck hates crunches and my spine hates to side-bend. Both cause me pain. So I avoid them. And move on. What is scoliosis? Scoliosis is still not about sitting still. I am an advocate for all movement. I don’t want you to live in your Scolio-Pilates corrections all day every day. I don’t think it’s healthy and I don’t think it’s necessary–I am pain-free with 20-25 minutes of work a day. All of us in the field of corrective scoliosis exercise are doing our best to offer you the best advice. But what if we’re missing something? Even though we don’t practice (1) side-bending, (2) twisting and (3) spine extension in our Scolio-Pilates homework, would we really want to live in a spine that wasn’t able to do all three of those motions? Did you know that all three are required motions to just get out of a car? Even though Scolio-Pilates allows me to do “real life” without pain, I wouldn’t want to miss out on all the opportunities that real life has to offer because it had too much rotation or side-bending. I still play golf and I still do yoga. I have scoliosis. It is a deformity of the spine. And I am not deformed. I can still do it all. And because of Scolio-Pilates I am almost always pain-free.